On sale from all good bookshops or buy direct from our shop. 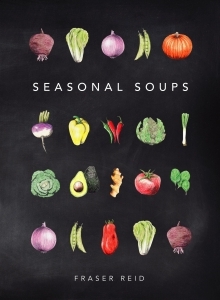 Enjoy the beautiful new hardback edition of our best-selling soup book Fraser’s Seasonal Soups, with additional photography by Kathryn Rattray. Packed with 52 mouth-watering recipes, this is an irresistible collection. The book features everything from winter favourites like Alternative Scotch Broth to dinner party dazzlers like Plum Tomato, Orzo & Oregano Soup. It’s also 100% vegan-friendly, with tips to add dairy or meat according to your preferences. The recipes are organised monthly to ensure that you’ll be eating what is fresh in shops when it tastes the best: the most economical and flavour-filled way to make the most of our wonderful seasonal produce. Written by soup-obsessed grocer Fraser Reid and road-tested by his loyal but exacting customers, Seasonal Soups will inspire you to create exceptionally tasty soups for every occasion.